By Khadija Sharife. When does a man – bound to a wheelchair – become an Enemy of the State? When Marc Ona arrived at the recent three day *New York Forum Africa*, a Libreville-based development event attracting reams of politicians and businessmen, his name was enough to have him arrested by attendant police (note: released on June 8). Along with some some 31 others, Ona was cited by Gabon’s Interior Ministry as behaving violently, to make a ‘noise’. 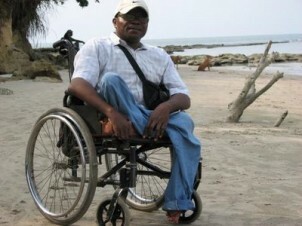 Ona is renowned as an ‘award-winning environmental activist’ by organizations such as the prestigious Goldman Environmental Foundation, who described him a tireless leader seeking – victoriously – to, “publicly expose the unlawful agreements behind a huge mining project threatening the sensitive ecosystems of Gabon’s equatorial rainforests..” But the essence of mega-development contracts, particularly those related to ecologies, transcends the majestic environment. Instead, the system underscores the deliberate socio-political structures of capital-intensive dirty-industry development models that have created and sustained inequalities. And this, by virtue of the design; not in spite of it. In this regard, Ona (an Ejolt contributor on our forthcoming report, due mid-July) should be regarded as someone fighting for justice against those who remain indifferent to it. And rather than celebrate him as an an exceptional individual, One should be understood as a brave voice on the frontline of a great tide of consciousness, for a world, we must hope, that is slowly, but surely, awakening.